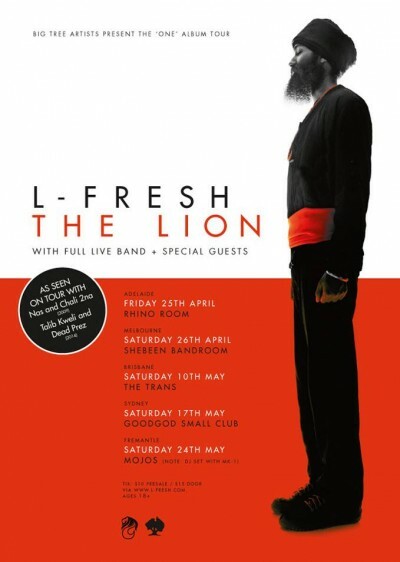 We’re stoked to host L-Fresh The Lion on his first national tour in support of his debut album ‘One’ and his new single ‘Survive’! He’ll be swinging by the Danceteria for an early show with his full 7-piece band. L-Fresh The Lion has proven to be one of Australian hip-hop’s fastest rising stars with the release of his debut single ‘One’, which achieved solid Triple J rotation, and it’s follow up ‘Faithful’, which saw the Melbourne via Sydney emcee perform sold out headline shows across the east coast. L-Fresh also spent much of 2013 and the beginning of 2014 touring with a number of Australian heroes and international acts, including the likes of Horrorshow, Machine Gun Kelly, Dead Prez and Talib Kweli.